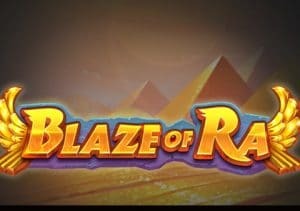 Enjoy some scorching ancient Egyptian action in Blaze of Ra, a fiery, 5 reel, 40 payline video slot from Push Gaming. Highlights include nudging wilds and a free spins round where reels 1, 3 and 5 are all wild. Play on your desktop, tablet or mobile from between 20p and £100 per spin. Ancient Egypt is a very popular genre so finding something fresh to offer isn’t always easy for developers. Push Gaming has given it a pretty good stab here though, combining classy design with some potentially exciting extras. The dusty Sahara desert, the mighty pyramids and an animated Ra form the backdrop to the reels here. The reels are made up of blocks and include A to J playing cards, a flower and hieroglyphs featuring the eye of Horus, a sceptre and an ankh cross. They’re joined by the dog god Anubis and the cat god Bastet. Land 5 of the latter in combination and you’ll pocket an award equal to 20 times your total stake. Helping to create those winning combinations is the bird god Ra which is the wild. It replaces everything apart from the scarab beetle scatter. It also offers awards of up to 50 time your stake in its own right. Ra is also central to 1 of the game’s 2 bonus extras. Nudging Wilds feature – these become active when Ra wilds appear in the top 2 positions of a reel before a spin. These symbols then nudge down the reel while the other reels spin normally. Free Spins feature – land 3 or more scarab beetle scatters on the same spin to trigger this feature. Each scatter from the triggering spin awards 1 or 2 free spins. That might not sound like many – boosting your winning chances reels 1, 3 and 5 which are wild throughout. Every time you land a scatter, 1 more free spin is added to your tally. There’s much to like about this Arabian adventure. The design is well done and the features offer something a little different. We found it to be pretty volatile too. Delivering a novel take on a classic theme isn’t easy but Push Gaming has come up trumps with Blaze of Ra which lives up to its name by delivering some potentially red hot thrills. If you like video slots based on the Sun God Ra, you also have Novomatic’s Book of Ra Deluxe which is the benchmark for all ancient Egyptian themed games.